Testing laboratory of VinaCert was set up in 2009. At present, VinaCert’s testing laboratory is invested to extend the infrastructure, equipments in Hanoi and Can Tho. The testing laboratory is divided into 2 areas: Chemical Testing zone and Biological Testing zone with the total area of 260m2 in Hanoi and 300m2 in Can Tho. The Biological testing zones are scientifically designed according to the path principle of one-way samples and automatic environment control systems. All steps from sample receiving, analysis, logs noting to results returning are performed on software and assigned with high specialization. A great amount of tests that VinaCert is capable of testing ensures that VinaCert meets most of the needs of tests specified in current international standards and national technical regulations, especially in the field of agricultural materials (animal feeds, fertilizers, plant protection products) and agricultural food. VinaCert uses TCVN, AOAC, FDA,.. test methods. The test methods and the latest advances in analytical techniques are always updated. With professionally, formally trained staffs and modern equipment, VinaCert entirely can make the clients have confidence in the accuracy of test result reports. Test results of VinaCert provide strong base to register for national technical regulations certification, international standards certification, VietGAP, GlobalG.AP, ASC and MSC certification. - Analyzing the microbiological parameters of biological products such as: Bacillus subtilis, Lactobacillus. - Residues of heavy metals: As, Pb, Hg,..
- Residues of plant and animal growth hormones. - Microelements and heavy metals. - Analyzing the composition of substances in cattle-feed, cattle-feed materials and aquaculture feed materials such as: protein, fat, amino acids, fatty acids, vitamins, energy value, digestibility, ..
- Analyzing microelements and heavy metals. - Analyzing active substance content. Analysis staffs of VinaCert are experienced professional trained in analysis and testing field meeting the requirements of the International Standard ISO/IEC 17025- General requirements for competency of testing and calibration laboratory. Currently, the number of analysts of VinaCert is 40. VinaCert laboratory is invested with the most modern equipments. - UHPLC ultra-high pressure liquid chromatography. VinaCert testing activities are internationally accredited and recognized: Testing results of VinaCert are accepted worldwide through ILAC-MRA A2LA mark on the testing result reports. 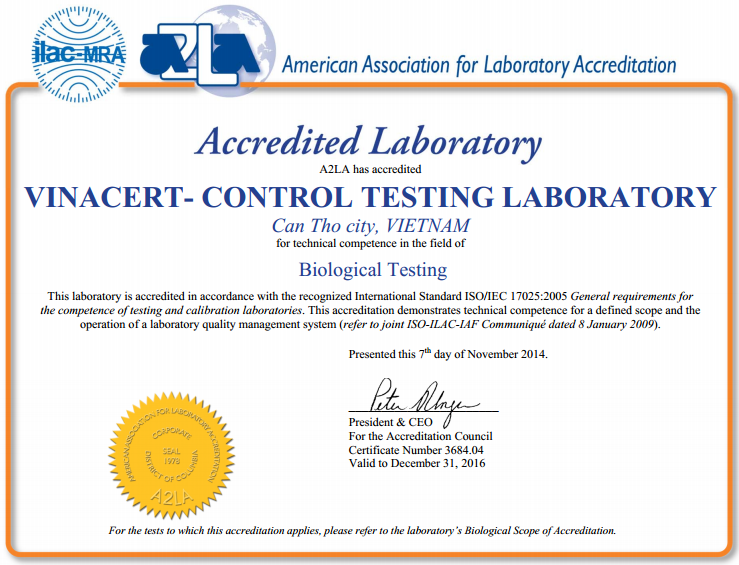 VinaCert is the only organization in Vietnam accredited by American Association for Laboratory Accreditation (A2LA) – member of International Laboratory Accreditation Cooperation ILAC to be adequately competent according to International Standard ISO 17025:2005 – General requirements for the competence of testing and calibration laboratories - in providing goods quality testing services. The testing laboratory of VinaCert is designated by Plant Protection Department – Ministry of Agriculture and Rural Development is quality and residues of plant protection products laboratory, designation code: LAS-NN 92. (Decision No. 528/QD-BVTV-QLT and 2581/QD-BVTV-QLT). The testing laboratory of VinaCert is designated by Department of Livestock Production – Ministry of Agriculture and Rural Development is Animal feed laboratory, designation code: LAS-NN 01. (Decision No. 206/QD-CN-TACN). The testing laboratory of VinaCert is designated by Department of Cultivation – Ministry of Agriculture and Rural Development is Fertilizers testing laboratory, designation code: PKN-PB 10-08. (Decision No. 291/QD-TT-QLCL). ð When the products are not have enough quality and safety that will adversely affect health, environment, economic efficiency. So, currently, the government authorities lay down as a policy socializing designated laboratories to enhance the protection of product quality for domestic consumption and import- export. Why choose VinaCert Testing service? In production, result of goods quality testing activities plays an important role in goods conformity assessment activity for the requirements of State agencies, market and quality standards. Especially, before economic integration period, testing increasingly become indispensable activity to overcome technical barriers, and promote export and import of goods. Searching competent and designated testing laboratories to provide correct, reliable and global value testing results is one of required conditions to prove prestige and position of enterprises in the domestic and international market. Laboratory of VinaCert Certification and Inspection JSC has officially operated since 2009 with the initial task is to support certification activities. After 5 years of development, VinaCert laboratory has become a reliable address for enterprises in the field of testing of food, agricultural and forest products, etc. Laboratory of VinaCert serves customers with the motto: Accurate - Reliable - Professional - Timely. With many advantages, the laboratory of VinaCert ensures to meet all customer requirements. 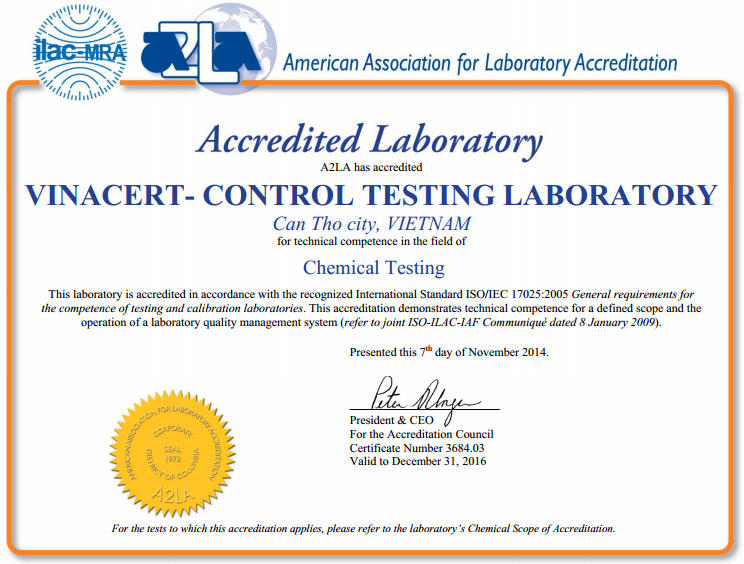 Testing activities of VinaCert are internationally accredited and recognized: VinaCert is the first and only organization in Vietnam accredited to be adequately competent according to ISO/IEC 17025:2005 - General requirements for the competence of testing and calibration laboratories for the both of VinaCert - Hanoi and VinaCert - Can Tho laboratories by American Association for Laboratory Accreditation (A2LA). Thus, testing results of VinaCert are accepted worldwide through ILAC-MRA signs on the testing result reports. To be accredited by A2LA_an international accreditation body and to be accurate – reliable testing results: Laboratory of VinaCert always uses accredited reference material/ strain to ISO/IEC Guide 34, and annually shall participate in accredited proficiency testing scheme to ISO/IEC 17043. With accreditation of international body A2LA, VinaCert demonstrates testing competence, ensures high accurate and reliable testing results, and particularly can provide "power" testing results for customers to be adequately condition to clearance quickly export goods and reduce to lowest cost. Domestically, State agencies designated VinaCert is testing laboratories in various fields. Equipments of VinaCert laboratory are invessted modern today: LC-MSMS, HPLC, UHPLC, GCMS, GC-FID, ICP System and MP-AES 4100 are systemized in professional infrastructure. Staff team consists of highly experienced, responsible and conscientious. Testers have qualified postgraduate in Chemistry, Biology, Food technology, Seafood processing, Aquaculture, Environmental science, etc. They are usually trained and enhanced competence, meeting ISO/IEC 17025:2005 requirements. Laboratory operation is management software from receiving sample to returning result to customers, ensuring to provide objective and accurate testing results, and enhancing labor productivity. Always update the latest technical progress in analysis. Testing results of VinaCert have enough of foundation to register standard and regulation conformity certification, VietGAP, GloabalG.A.P, ASC, MSC. Customers are easy to register services with testing activities such as quality testing in imported animal feed, product quality inspection in goods, standard and regulation conformity certification. With two laboratories in North and South and online registration service through websites www.vinacert.vn, VinaCert provides testing services to customers as soon as possible.